Home » Home Page » Celebrating Spring with Kids ! It’s springtime and Spring brings new life, renewed hope, and fun times for families to share. It’s time to celebrate, get creative, go outside, and embrace nature. 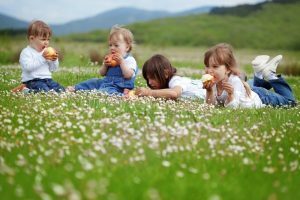 Here are 6 of the Best Spring Activities for Kids, guaranteed to put a spring in everyone’s step! This is the perfect time of year to visit a pet farm. After the long winter, the kids will love to run around the farm, taking in all the delights of spring. Feed a bottle to a baby lamb or cup a baby chick in your hand. Pop on your helmets and hop on your bikes and cycle one of your favorite routes. Every child loves gardening, there’s something about squishing your fingers into the soil and of course, the watering after you’ve planted the seeds is so fun. Grab your magnifying glasses and a plastic tub and head off outside for a Ladybug Hunt. When you find one carefully put it in the tub so you can count its spots. You might want to make a Ladybug Chart showing how many ladybugs with different numbers of spots you find. When you are finished, gently let them go. Sometimes the old ideas are the best. Springtime is often a breezy time perfect weather for heading out with a kite to a nearby park or hill. Weather permitting, camping is great fun and a chance to “become one with nature”. Many fond memories are created sitting around a campfire telling jokes or scary stories and watching the stars at night. At our Kidscape Early Learning Centres, we are also celebrating spring with lots of arts and crafts projects in Spring theme, enjoy more time outdoors in the garden and playground. Come to visit us at our centres and share the joy of this great spring season.